The Disney princesses are going to attend a very important event and they will have to choose a nice dress to attend. They are Elsa, Anna, Rapunzel and Ariel and we will have to prepare their outfits to go to the event of the year in the Disney world. We will start with the little mermaid and it will be the turn of makeup. You should apply the lipstick that you like, lashes, rouge and eyeshadow. When ready, we will go to the closet to choose your dress. You can combine two pieces or choose a one piece suit for the girl, in addition to adding the accessories that best match your choice. When you finish, we will move on to the next one and so on until they all look spectacular in their dresses. 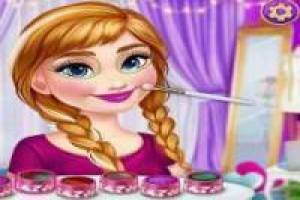 Enjoy the game Disney Princesses: Ball gown, it's free, it's one of our disney princesses games we've selected.